HUD512 Austin House Buyers can show you how to sell your house fast in three easy steps. We pride ourselves on making the whole home selling experience as easy and hassle-free as possible. 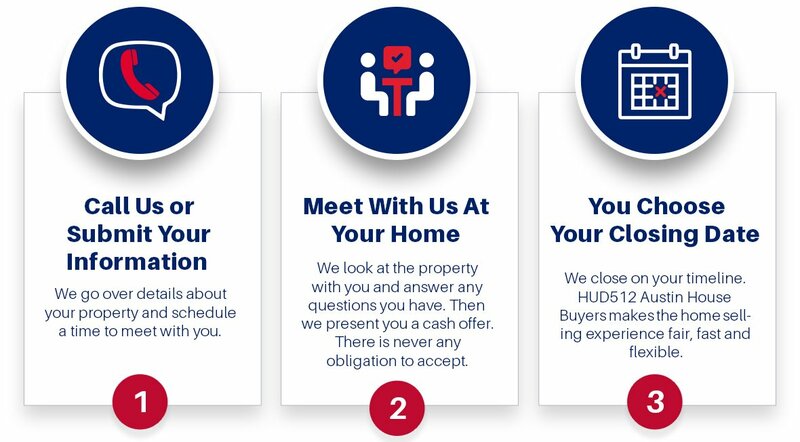 No matter if you are located in Austin, Round Rock, or the Hutto area, our home buying process allows us to buy houses fast with cash. HUD512 may not be the right fit for everyone, we want what’s best for you and your family, even if that means we don’t buy your home. We buy houses in and around Austin, Pflugerville, Manor, Leander, Cedar Park, Bastrop, Hutto, and several other areas too!. We’re not listing your house… we’re actually the ones buying your house. Because we pay cash, we’re able to close quickly… or on your schedule. Like we’ve mentioned, when you work with us there are no fees… like there are when you list your house with an agent. What this means to you is you don’t have to worry about extra costs, having to come out of pocket to sell your house fast, or even getting your house ready for a sale (we’ll buy your house as-is). If you’ve found yourself in a situation where you own a vacant property, are upside down in your mortgage, have fallen behind with your payments, owe liens, have downsized and your house won’t sell, are living in a home that needs repairs you can’t afford, own a fire damaged home, or have suffered from bad rental tenants, etc. . . HUD512 can help! We’re not a big national company from some other state, we are a local and family-owned real estate investment company. We know the Austin real estate market and we specialize in providing real solutions when you need to sell fast or have a property that needs lots of work or updating that you just don’t want to deal with anymore. Stop the frustration of your unwanted property. Let HUD512 buy your Austin, Texas house now, regardless of condition. We are Professional & Experienced Austin Home Buyers who specialize in buying homes for cash in “as-is” condition, we buy ugly houses and we buy pretty houses all over the Austin area. 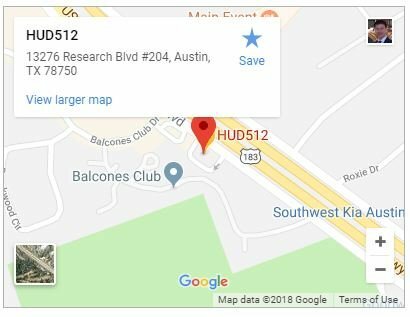 HUD512 buys houses in and around Austin (and other areas too!). Since we’re actually the ones buying your house and we pay cash, we’re able to close quickly… or on your schedule. Stop wasting time and money trying to sell your home the traditional way. Fill out the form below or call us right now at 512-994-4483 to get a fair cash offer on your home.